As a supply chain professional, your goal is to have your suppliers deliver on time, consistently produce quality materials and reliably communicate with you. If the financial health of just one of the links in this chain falters, the consequences often are disruption and financial loss. For example, if a supplier is in financial trouble and chooses to cut quality control, their shipments could be affected in short order. Play that scenario out: you order a batch of parts, but since the supplier is cutting costs, the shipment is poorly packaged and arrives to you mangled and unusable. Or late. This kind of misstep costs you time and money and could even shut down operations, which is why monitoring the financial health of your supply chain is so important. Predictive in nature, the FRISK® Score provides timely insight into a company’s financial health. If a company’s score drops into the red zone, or a score of “5” or lower on the 1 (worst) to 10 (best) scale, this is an indication that further investigation might be necessary. A falling FRISK® Score provides an early warning that trouble could be brewing. Once you've been alerted to increasing risks, you want to look for sequential weakening of key financial metrics. For instance, liquidity changes signal financial hardship right off the bat. 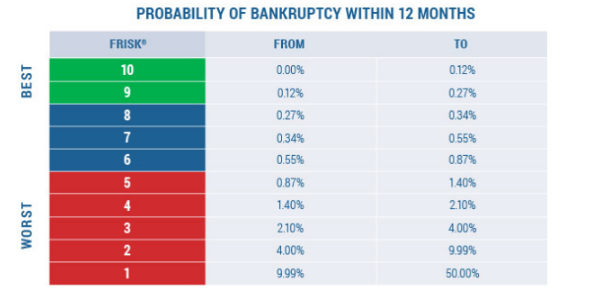 If assets are decreasing and liabilities are increasing, you’ll want to be wary of instability. Now is the time to initiate one-on-one contact and talk to your suppliers for a quick checkup. 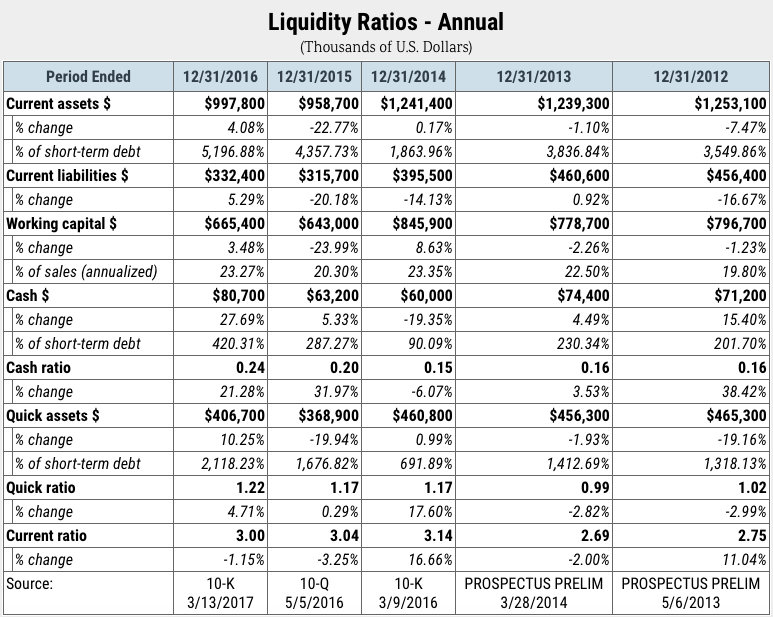 Below, we look at the annual liquidity ratios for Ryerson Holding Corporation, CreditRiskMonitor FRISK® Score of "2:"
Annual liquidity ratios for Ryerson Holding Corporation, CreditRiskMonitor FRISK® score of 2. Evaluating the industry as a whole, and how the company in question is doing relative to the industry, can also reveal stressors. If a company’s FRISK® Score is well below that of its peers within the same industry, this could be an indicator of deeper financial hardship than you suspect. Even worse, you might find you are working with a struggling supplier in a struggling industry. You could overlook this risk quite easily if all you do is examine the financials of your supplier. Thus, compared to an industry FRISK® Score average of "6" in Iron and Steel in the graph below, Ryerson's prolonged struggles are an alarming optic. 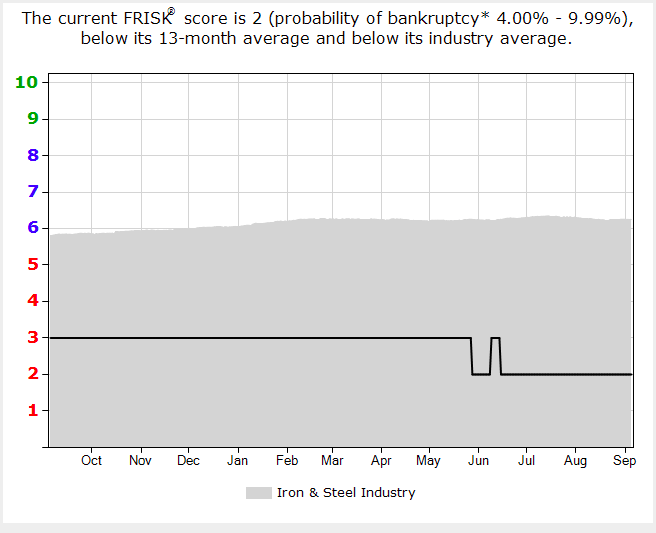 CreditRiskMonitor Iron and Steel Industry FRISK® Score Range. The grey range is the industry average, with Ryerson Holding Corp. illustrated with the black line. Decreased emphasis on R&D - If the steel industry is researching ways to make lighter, stronger steel, but the company in your supply chain isn’t participating in this research, it could mean their steel doesn’t make it into the next generation of your automobiles. For you, this means going through the time and cost of finding and approving new suppliers that are putting in the required research to keep up with a changing market. Insufficient Packaging - As mentioned in the example above, packaging is a critical factor. Receiving your goods in working condition is vital to proper business function. If your supplier cuts back on packaging, even high-quality parts could be turned into expensive paperweights. Product Quality - You pay for usable parts, yet if a company is trying to save money, it may cut corners on product quality. This could leave you with less usable parts than you ordered, parts that jam your machinery, an elevation in the returns of your finished products or worse, an entire batch of parts that you can't use. Late Shipping – Just-in-time inventory is a great way to reduce the cost of holding a large backlog of parts. But it becomes a risky proposition if you don't get the parts when you need them. You could be at risk for a shutdown and significant revenue loss as a result. Outsourcing to Save Money - Brand damage can be just as harmful as late shipments. If your supplier is outsourcing to an unknown entity in an effort to lower costs, your brand’s name could be at risk. Knowing your suppliers abide by laws and regulations – child labor laws, working condition regulations, etc. – is key to a brand’s reputation. There's also the risk that your supplier's supplier is financially weak, which could leave you in the lurch, as well. Keeping a watchful eye on the financial health of your supply chain should always be a priority. Business failure doesn’t have to come as a surprise. The right tools can provide you enough time to devise a contingency plan and protect your business.